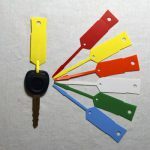 The Econo Auto Dealer Key Tags are the simplest way to organize all the keys in your dealership. Tough, long lasting, and easy to write on, they are the best way to keep track of all your vehicles. The Econo Auto Dealer Key Tags are the best way to organize all of the keys in your dealership. 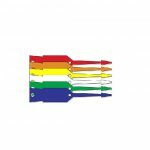 Color-coded for better organization, these key tags with ring attached are also durable, easy to write on, and have a self-locking design. 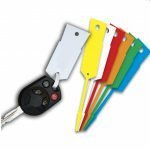 With these key tags, automotive businesses have the ideal way to look after a large number of keys. They are ideal if you want tags that will last a long time while making organization easier than ever. Econo Key Tags are the easiest and most effective way to look after a large number of vehicles without mixing any up. We have other key tags in our store. Check out our Self-Laminating Key Tags and Automotive Poly Key Tags if you are looking for something different. We can deliver to anywhere in the USA in as little as 1-5 days, so make your key tags order today and we’ll send it out immediately.